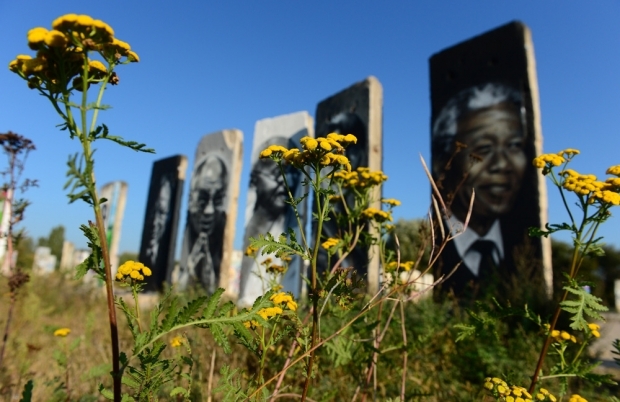 In a vacant lot in Tetlow, Germany, rest slabs of the old Berlin Wall painted with portraits, from left, of German politician Willy Brandt, Tibet’s exiled spiritual leader the Dalai Lama, Indian independence movement leader Mahatma Gandhi, Burmese opposition politician Aung San Suu Kyi, and South African anti-apartheid revolutionary Nelson Mandela. Pretoria’s apparent refusal to grant Tibetan spiritual leader the Dalai Lama a visa to attend a summit of Nobel peace laureates has sparked outrage in South Africa. Critics allege the government is bowing to China, undermining South African sovereignty. China’s long-held policy toward the Dalai Lama is clear: Any country that welcomes him will pay a price either diplomatically, economically, or both. African leaders across the continent are watching this event carefully as an indication of how China can throw its hefty weight around when it wants to assert itself with much smaller, less powerful states in Africa.